As you might expect, minor spoilers ahead. Only minor ones, though, so if you want to read more you should be safe. Normally, I think that Western authors trying to write non-Western-based fantasy doesn’t work; not because they can’t, but because they don’t put in the research necessary to make it feel alive. There’s a reason why most fantasy in Western, English-speaking markets draw on English and French concepts for setting, with influence from Norse, Celtic, and Greek for the fantasy elements. It’s not because of racism, as is sometimes opined by people who see it everywhere except where they themselves stand. The reason is simple expediency. It’s the same reason Shakespeare could draw on English, French, Italian, and Classical sources for an audience primarily comprised of illiterate Londoners: they were elements used in other plays, songs, and tavern tales, for multiple generations, and so the audience had at least a passing familiarity with the subject matter. It’s rather similar today to how we can expect an audience to understand the basics of World War II even if they’ve never studied it properly, and can therefore enjoy a movie about Captain America fighting super-Nazis. Giving an audience something unfamiliar is a challenge. One of the reasons I think of Eddings’ Belgariad and Malloreon as my standard for epic fantasy is that he did just that: he described non-Western settings in a way that let them feel alive, and he did so by starting the story in a western setting (literally western, in his world) and gradually taking the characters, and therefore the audience, into unfamiliar territory. A reader has time to get grounded in this world before being slowly introduced to less and less familiar settings. 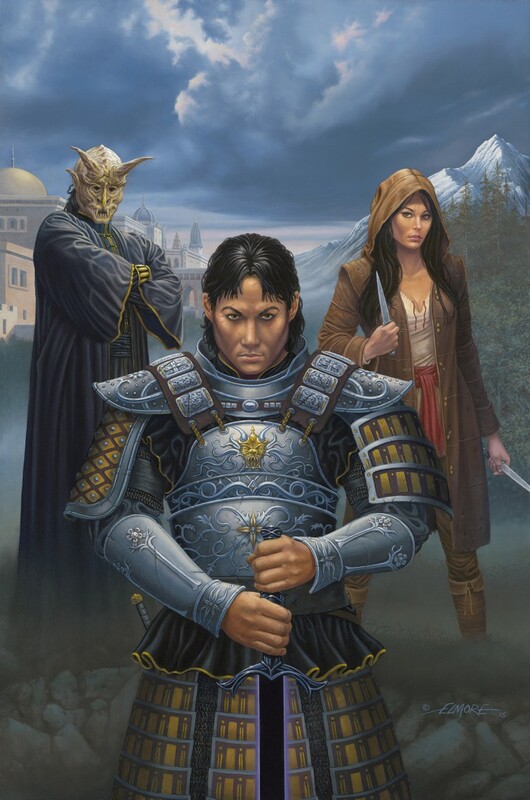 For all that I love Sanderson’s Stormlight Archive series (all two books of it), it’s hard to ease into the setting. He had the same problem with Mistborn. It’s delightful to have a different setting, but we have very little to ground us as we read through the beginning. It takes a commitment that several of my friends just haven’t been willing to give. Correia’s Son of the Black Sword manages to do this without much effort. The world around the reader is strange and alien, but you’re given context as you start the story, even as you find yourself puzzling over the various details. You’re given just enough to ground you, and nothing more. Correia’s been good at setup and payoff, but here is where he’s given himself a chance to shine. The device used is deceptively simple, and it’s how he’s started his other two series: with a fight that illustrates some of the ground rules of the setting. In Monster Hunter International, the main character is introduced to the world of monsters when his boss transforms into a werewolf and tries to eat him. In Hard Magic, the main character is working with the FBI to take down a couple of magical criminals. In Son of the Black Sword, the main character is hunting a demon from the sea. But the key isn’t the fight itself; it’s the insight gained into the character as we watch him fight. These scenes ground us in his perspective, and we then use that as a baseline for exploring an increasingly strange world. The unexpected part for me was how well it would work for such an unfamiliar setting, with such an unfamiliar character. Ashok isn’t just a character from culture that uses no exclusively Western concepts (well, except one, but it’s blink-and-miss-it); he’s an outsider even among his own people. And yet, that status feeds back in to his perspective, giving us a point of view that looks on the world around him with a different eye, even if he’s not got the same perspective on it as his audience has. Even when we move away from his perspective, that feeling stays with us, and we learn more about the society as we go. The simplest way of describing that society would be “rigid Confucianism in an Indian caste system.” Even that, however, is only scratching the surface. Calling it a “non-Western” setting might be a bit misleading, as that might imply you should expect obvious parallels; but Correia has taken inspiration from Asian history and myth in such a way as to give you an impression of a culture that could have been, rather than a patchwork of elements. The strangest part, though, is just how those elements came together. Let’s just say I spotted a few things, and you might too, that leave me speculating on further twists down the line. The story begins simply enough, in rather traditional epic fashion. We begin in medias res, as Ashok the Protector hunts a demon from the sea. Anyone who’s seen a Japanese monster movie begins to get grounded in the setting by the time we get to the demon’s description. Those who’ve studied East Asian history begin to find things to hang on to even earlier. Even if you have no experience with either, by the time the fight is over, you’ve grown to identify with Ashok . . . even if you’re not quite sure who he is. After that, however, we begin to diverge. We get periodic flashbacks to Ashok’s childhood, first starting with his training as a Protector and then, later, into his early life. In the present, however, we have a story of Shakespearean framework, as if Hamlet were combined with a reversed Henry V. We find a society on the precipice, so close to the edge that one false move will cause disaster; and this society has so systematically suppressed its own history that only a few people know what’s really going on. Oceania has always been at war with Eurasia. Now, a lack of interest in “true history” isn’t an unusual thing. Actually, one point I always stress whenever I talk on worldbuilding at conventions is that an obsession with accurate history is a recent aberration. For most of history, people have only been concerned with the recent, the now, and the immediate future. Spending time exploring the ruins of the past is a luxury that can only be sustained in a modern society where most people don’t have to be concerned with growing their own food. But the society of Lok, the continent Ashok lives on, is deliberately kept ignorant. The old tales are illegal, and religion is banned. No one has freedom; everyone has a place within the law, as Ashok keeps repeating. As time goes on, however, Ashok’s statement moves from being a simple statement of fact to a protective mantra, and then to a growing worry. Disaster looms for Lok, but it’s a disaster we can see coming precisely because it would be so easy to avoid. And yet every action taken is in character, and the reader can see how it makes sense for each person at each turning point. It’s like watching an avalanche or tsunami from miles away: perfect, beautiful, inevitable, dangerous, and utterly terrifying even as you know that you, personally, are safe. The only nitpick I really had was the beginning. Correia has a talent for very strong opening words, to the point that I always use the opening lines of Monster Hunter International as an example of how to do it. At first glance, the opener in this book is lukewarm, almost amateurish. It is only after you have read through Chapter 12 that you can truly see the genius of that opening, and it gets even better as you continue through the story. It might not be the best for first readers, but it’s a killer opening on a re-read. Every detail is perfect from that perspective. The cover of the book is a simple, almost minimalist affair, with the author’s name, the title, and the emblem of the Protectors. However, that wasn’t the original cover. Inside the book you’ll find that cover art as a frontispiece by Larry Elmore. That cover depicts three people: Ashok is clearly one, as identified by his black steel sword, Angruvadal. The other two . . . well, I’d rather not describe them, because finding out exactly why those two are on the cover, as opposed to the many other characters who could be there, really is part of the fun. Most of the book is centered on Ashok, bearer of the sentient sword Angruvadal; but he is, by far, not the only perspective we explore. We have a wide array of characters, actually, each one with his or her own part to play. Sometimes, it’s hard to tell exactly how important they’ll be; one bit character, almost there are background noise, is later a major antagonist. Another, who appears to have served his purpose by Chapter 13, winds up being one of the most compelling characters in the story. While a large and shifting cast, the characters are all distinct and the reader easily adjusts to the perspectives as the story progresses. We have just the right amount from each, without any excess. The story is amazingly character-driven, not just because the plot is about the characters’ decisions but because the plot literally could not happen without these characters making exactly these decisions, and yet each decision is completely natural. There is nothing forced or ham-handed about it, and with a story with so many moving parts that’s almost to be expected. Instead, we have a near-perfect progression of surprise and inevitability: hard to predict, but instantly fitting a pattern once done. There was one twist that was perfectly done. I was immediately struck by how obvious it was and how I should have known it all along . . . and yet, as I reflected on it while writing this review, I find myself wondering if I could have known. It’s a case of revealed identity almost as strong as Darth Vader being Luke’s father, but with vastly more clues being laid before the audience. That’s genius writing. I’ve been keeping an eye on Larry Correia for the last five years, and his growing popularity is justified by the quality of his storytelling. Even so, I was surprised by the richness of this book. This book is now on my “assigned reading if I were teaching a creative writing class” list. I thought I would like it; I didn’t expect to rave about it. I plan to start reading more Sci-Fi. I’m halfway through The Last Centurion, and I find it speaks to me, perhaps because it’s a dystopia. The narrator has a strong voice, which is a must for me. Correia’s new series might be where I will go next. I depend on characterization in my reading, and sounds like these characters are complex. I can’t read books without strong characters. I need to see inside them, not just the surface, or the books fall by the wayside. Agree. I really enjoyed the The Grimnoir Chronicles (especially the Audiobook versions with Bronson Pinchot. For his latest novel I read the ebook version starting on the day it came out. As you noted this is very character driven. You had a clue at the start that Ashok had a lot a room to develop as a character with his various cultural prejudices. But even more minor characters were somewhat fleshed out. Mostly I enjoyed the ride and there was enough unpredictable in the plot to keep you engaged. Coreia is really developing as a writer. As for Sanderson, I love him, but he drives me crazy with all the series he has going. Mainly I just want new Starlight books.